The latest innovation in sauna bathing is through the use of infrared sauna heaters. Unlike electric sauna heaters or wood sauna stove, infrared sauna panels heat the objects directly not the air. This results in a cooler interior sauna air temperature while still providing the same effects to the body resulting in perspiration. Infrared sauna heaters come in a variety of heating technologies. We believe that carbon fiber sauna heater panels provide the best benefits. 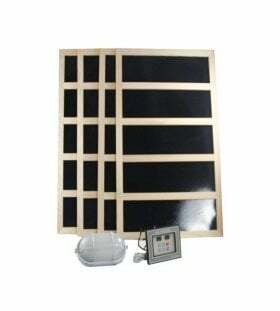 Our infrared sauna heaters are available in 110 VAC or 220 VAC options, and you can save by buying complete infrared sauna panel kits that come with the controller.